Regular visitors to my blog posts will know just how much I love to use the Birthday Blooms stamp set - it's one of my all time favourites. However, before today, I had never used the little flower in the set! Mixed a few drops of Perfect Plum ink with a small amount of water and soaked a length of Whisper White Classic Weave ribbon which I then hung to dry. Cut a circle from a Post It Note with the 1 3/4" circle punch and positioned it on my piece of Sahara Sand cardstock. Cut a mask from Window Sheet with the Eclectic Layers Thinlit. Smooshed the coloured embossing paste through the mask onto the lower part of the card. Speeded up the drying process (normally about 10 minutes) with a heat tool. 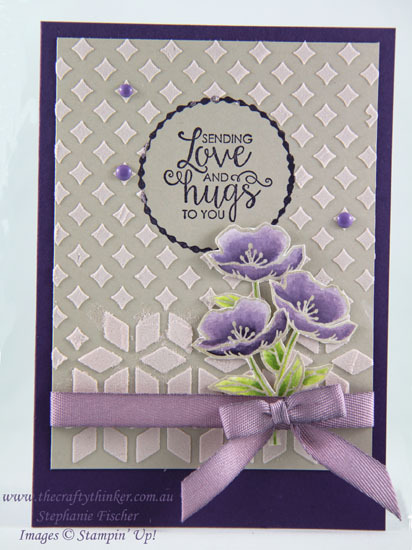 Positioned the Pattern Party mask and smooshed the coloured Embossing Paste through it onto the top part of the card. When the paste was dry, stamped the circle from the Eastern Beauty stamp set and the greeting from the Ribbon of Courage Stamp set, using Elegant Eggplant ink. Using the flower from the Birthday Blooms stamp set, tapped into Versamark followed by Sahara Sand ink and stamped onto Whisper White cardstock. Added clear embossing powder and set with the heat tool. Watercoloured the flowers using Perfect Plum, Elegant Eggplant, Lemon Lime Twist and Wild Wasabi inks. Fussy cut the flowers and added them to the card front with some glue dots. Added my Perfect Plum ribbon (see step 1) to the card and made a bow which I attached with glue dots. Added a few Perfect Plum Enamel Shapes. Thank you for visiting, I hope you enjoyed this card.